Jo has recently been working with Cornwall Libraries to develop the Loop the Loop project. Recent creative direction includes Remapping St Ives (2013), A Festival of Wishes (2011) and Twinkle Twinkle (2010). Jo is also a founding member of Cornwall-based artist film group Cinestar. Jo's recent practice has involved working with 16mm film, using a Bolex camera and hand-processing film in her kitchen using Caffenol (instant coffee, vitamin C, washing soda and salt). Jo especially likes the fact that all these ingredients are already present in her kitchen (if not usually mixed…), creating a sense of domesticity within the practice. Jo has also been collaborating with jazz musicians Michelson Morley to make simple films recording the physical details of the relationship between the musicians and their instruments. Hand processing creates unexpected physical interventions; especially appropriate to a musical practice which is based on improvisation. Jo also provided live visuals, based around this footage, for the launch of Michelson Morley's debut album 'aether drift' at The Cube in Bristol (April 2014). Melodic, atmospheric, minimalist music led by Get The Blessing saxophonist Jake McMurchie and featuring the best of Bristol’s jazz scene in the form of Will Harris on bass, Mark Whitlam on drums, with special guest and vortex regular Dan Messore on guitar. Electronics and acoustic instruments combine with an evolutionary approach to improvisation to create scientifically aural magic. The recent collaboration between Michelson Morley and Joanna Mayes led to what Jo describes as an 'un-pop video' can be seen here. Founded in 2004 by Nicholas Rawling, Imogen Charleston and Christopher Reed, The Paper Cinema perform a unique blend of live animation and music, which continues to tour around Britain and Internationally. The company uses the language of animation, music, film and theatre to lead the viewer through a variety of stories. Intricate pen and ink illustrations are manipulated in front of a video camera and projected in real-time onto the big screen alongside the live music, which is integral to the work. ‘The Paper Cinema’s Odyssey’ is the company’s most recent work, opening in spring 2012. August 2013 sees the show go to Edinburgh Fringe Festival as part of the British Council Showcase. 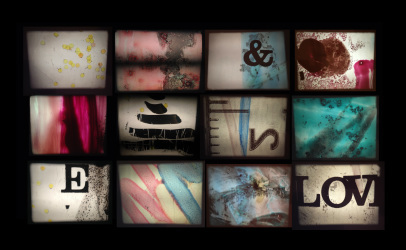 Jacqui Knight utilises a range of media within her practice, including film, video, photography and printmaking. Her current work is research based and emerges from an interest in simultaneous experience. Jacqui Knight studied at Falmouth College of Art followed by the Slade School of Art until 2003. She is currently a Phd Researcher within Transtechnology Research at Plymouth University and lectures at a range of institutions in the South West. Joe Greenaway, born in 1987, is a St Ives based artist. His work is a collision between ‘fine’ art and ‘street’ techniques, blending the spontaneous use of a spray can with the meticulous process of painted portraiture. Although a lot of Joe’s work involves the use of a spray can, he considers his work as ‘fine’ art rather than ‘graffiti’. Central to his mixed media canvases is the human figure, which is not always immediately recognisable. There is often a motive to Joe’s paintings, to purge deep emotions in his own personal life. Jo Salter is a project manager, curator, teacher, graphic designer and artist working in a range of media. Jo has over twenty five years experience of fine art practice and teaching as well as devising and collaborating on major projects across the UK. Jo is based near Lostwithiel, Cornwall. Joe has also made poetry platforms for the National Trust, inflated a giant screen-printed community-made balloon with helium and flown it, exhibited digitally designed bird boxes (and real ones) at the re-opening of the Bluecoat Gallery in Liverpool with Alec Finlay, run a meal for 70 people for Lucy Orta in Plymouth, managed a conference on studio provision in Scotland and made a short film with home-made windmills…. Jo has also taught life drawing at art school level and runs the Lostwithiel life drawing group.